Yoga is an ancient Hindu discipline, which has been around for over 5000 years. It is the practice of body postures, meditation and breathing control. 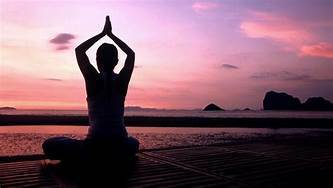 The word yoga means ‘union.’ There are up to 100 different types of yoga training that vary in intensity and method, but nearly all will include the basics of breathing exercises and simple meditation, as well as poses and postures that stretch and flex different muscle groups. So, why is it so good? The undeniable and outstanding overall workout and health benefits. Just see the reasons why below! Those who practice yoga are actually quite strong. Even though the idea of yoga is slow downing and connecting, it’s more of an idea of society today that only pumping iron and a heavy cardiovascular workout will give you strength. But the control needed in the various combinations of poses, or when you use straps, bolsters, and balls within yoga exercises, is just as toning and strength building, as weights because with yoga you are often holding your weight. With regular yoga training, and being able to keep yourself in yoga positions, you will strengthen the muscles in your core, back, arms and legs. Practicing yoga increases your flexibility. You are, essentially, stretching your muscles, the more you stretch, the longer they become. Most people will be aware that a tight muscle is an angry muscle. Stretching and having the ability to elongate the muscle is very beneficial. It frees up tension and blood flow, reduced the risk of a headache or stress and increases your range of motion. The yoga exercises also do not overwork the muscle as it is primarily about repetition and control. With regular practice, you will see improvement in your flexibility. As far as the body’s energy levels go, if you are low on a hormone called Cortisol, then you are low on energy. What is so impressive about yoga, and specific yoga poses combined with breathing techniques, is that it can actually help to increase Cortisol levels, which then reduce fatigue. Practicing yoga is essentially detoxing the body through exercise. When you stretch and strengthen muscles and are massaging your internal organs, you are rinsing toxins from the body. Your energy levels are boosted straight away, is receiving new oxygen and revitalizing your body on the whole. The respiratory system is made up of the lungs, the bronchial tube, and nose, plus air passages such as the larynx, pharynx, and trachea. Apart from being able to speak, it also is responsible for supplying the body with oxygen and expelling the carbon dioxide from the body. The breathing practices in yoga promote relaxation and calmness, but it also builds up great respiratory stamina. From here it can help the management of allergens that affect the respiratory system. Stress can also affect the respiratory system. This is done only with practice though, and medical opinion is still advised when you have problems breathing or any allergic reaction. For those looking for a low impact sport, Yoga is perfect, as it does not place any impact on the joints. This is ideal for those who have arthritis or any other joint inflammatory disease. Often you can do a variation on movements to better suit your capabilities. Combining low impact yoga training with a balanced diet will also contribute to weight loss. Even though it’s not a cardiovascular workout, your body is still working hard which in turn lends itself to dropping some body fat. Looking to increase your metabolism? Yoga can actually benefit that too. Most increases in movement or activity in life can increase a metabolism rate. As yoga is all encompassing, by working all aspects of your body and mind, balancing your system, is balancing your metabolism. Your metabolism is basically how your body turns the food you consume, into energy. It is a pretty complex biomedical process made up by digestion to detox the organs, circulation for clean, healthy blood, and muscle to burn calories. The more you burn, the more your metabolic rate increases and can then work again to burn those calories. Your circulatory system is a network of vessels and organs in your body, which are responsible for oxygen, blood flow, hormones, and nutrients. Also called the cardiovascular system it is made up of the heart, the lungs and the systemic highways. Because of it breathing techniques, controlled positioning, and muscle targeting exercises, yoga works all three of these systems at the same time and benefits your cardiovascular health a great deal. If you feel you need are more intense cardio workout while continuing yoga there are specific types of yoga you can try, such as Power Yoga, which has a higher intensity to its format. Because yoga works every part of the body, it can affect areas of your body that have been untouched by other training. This protects you from injury surprises by making sure these forgotten areas are taken care of. As for problem areas, it works these regularly, so there is less chance of injury. Not just injury protection but injury recovery too. There are specific restorative yoga courses you can do which guide your injury to restoration and prevention from further injury. The thinking behind the fact that yoga is good for athletic performance is not by replacing your regular athletic training with yoga, but rather yoga training also for athletic enhancement. Because yoga improves so many aspects of fitness, it will make any other training you do far more effective. There’ll be an increase in power, greater focus than before, better endurance and balance, and peace of mind. Many athletes in team sports or Olympic competition do yoga as part of their training program. Stress can reveal itself in the body in many ways, and in many areas. Muscles become tight, back or neck pain, headaches, sleeping problems, lack of concentration. By practicing yoga and incorporating its breathing and meditation techniques, you are developing skills to manage your stress levels. Aside from the wonderful physical benefits yoga cement in the body, your mind is also receiving an overhaul. T more the meditation and breathing comes easily and can turn into something you can implement throughout the day.